Prehistoric Europe is the designation for the period of human presence in Europe before the start of recorded history, beginning in the Lower Paleolithic. As history progresses, considerable regional irregularities of cultural development emerge and increase. The region of the eastern Mediterranean is, due to its geographic proximity, greatly influenced and inspired by the classical Middle Eastern civilizations, and adopts and develops the earliest systems of communal organization and writing. The Histories of Herodotus (from around 440 BC) is the oldest known European text that seeks to systematically record traditions, public affairs and notable events. In contrast, the European regions furthest away from the ancient centers of civilization tended to be the slowest, regarding acculturation. [clarification needed] In Northern and Eastern Europe in particular, writing and systematic recording was only introduced in the context of Christianization, after 1000 CE. Widely dispersed, isolated finds of individual fossils of bone fragments (Atapuerca, Mauer mandible), stone artifacts or assemblages that suggest Lower Paleolithic palaeo-human presence are rare and typically separated by thousands of years. The karstic region of the Atapuerca Mountains in Spain represents the currently earliest known and reliably dated location of residence for more than a single generation and a group of individuals. Prolonged presence has been attested for Homo antecessor (or Homo erectus antecessor, Homo heidelbergensis and Neanderthals. Homo neanderthalensis emerged in Eurasia between 350,000 and 600,000 years ago as the earliest body of European people, that left behind a substantial tradition, a set of evaluable historic data through rich fossil record in Europe's limestone caves and a patchwork of occupation sites over large areas, including Mousterian cultural assemblages. Modern humans arrived in Mediterranean Europe during the Upper Paleolithic between 45,000 and 43,000 years ago, and both species occupied a common habitat for several thousand years. Research has so far produced no universally accepted conclusive explanation as to what caused the Neanderthal's extinction between 40,000 and 28,000 years ago. Homo sapiens subsequently proceeded to populate the entire continent during the Mesolithic and advanced north, following the retreating ice sheets of the last glacial maximum. A 2015 publication on ancient European DNA collected from Spain to Russia concluded that the original hunter-gatherer population had assimilated a wave of "farmers" who had arrived from the Near East during the Neolithic about 8,000 years ago. The Mesolithic era site Lepenski Vir in modern day Serbia, the earliest documented sedentary community of Europe with permanent buildings as well as monumental art precedes sites previously considered to be the oldest known by many centuries. The community's year round access to a food surplus prior to the introduction of agriculture was the basis for the sedentary lifestyle However, the earliest record for the adoption of elements of farming can be found in Starčevo, a community with close cultural ties. Belovode and Pločnik, also in Serbia, is currently the oldest reliably dated copper smelting site in Europe (around 7,000 years ago). Attributed to the Vinča culture, which on the contrary provides no links to the initiation of or a transition to the Chalcolithic or Copper age. The process of smelting bronze is an imported technology with debated origins and history of geographic cultural profusion. It established in Europe about 3200 BC in the Aegean and production was centered around Cyprus, the primary source of copper for the Mediterranean for many centuries. The introduction of metallurgy which initiated unprecedented technological progress has also been linked with the establishment of social stratification and distinction between rich and poor and precious metals as the means to fundamentally control the dynamics of culture and society. The European Iron Age culture also originates in the East through the absorption of the technological principles obtained from the Hittites about 1200 BC, finally arriving in Northern Europe by 500 BC. During the Iron Age, Central, Western and most of Eastern Europe gradually entered the historical period. Greek maritime colonization and Roman terrestrial conquest form the basis for the diffusion of literacy in large areas to this day. This tradition continued in an altered form and context for the most remote regions (Greenland and Old Prussians, 13th century) via the universal body of Christian texts, including the incorporation of Eastern European Slavic people and Russia into the Orthodox cultural sphere. Latin and ancient Greek language continued to be the primary and best way to communicate and express ideas in Liberal arts education and the sciences all over Europe until the early modern period. The climatic record of the Paleolithic is characterized by the Pleistocene pattern of cyclic warmer and colder periods, including eight major cycles and numerous shorter episodes. The northern maximum of human occupation fluctuated in response to these changing conditions and successful settlement required constant adaption capabilities and problem solving. Most of Scandinavia, the North European Plain and Russia remained off limits for occupation during the Paleolithic and Mesolithic. Associated evidence, such as stone tools, artifacts and settlement localities is more numerous than fossilized remains of the hominin occupants themselves. The simplest pebble tools with a few flakes struck off to create an edge were found in Dmanisi, Georgia and in Spain at sites in the Guadix-Baza basin and near Atapuerca. These Oldowan tool discoveries, called Mode 1-type assemblages are gradually replaced by a more complex tradition, that included a range of hand axes and flake tools, the Acheulean, Mode 2-type assemblages. Both types of tool sets are attributed to Homo erectus, the earliest and for a very long time the only human in Europe and more likely to be found in the southern part of the continent. However, the Acheulean fossil record also links to the emergence of Homo heidelbergensis, and particularly its specific lithic tools and handaxes. Homo heidelbergensis presence is documented since 600,000 BP in numerous sites in Germany, Great Britain and northern France. Although palaeoanthropologists generally agree that Homo erectus and Homo heidelbergensis immigrated to Europe, debates remain about migration routes and the chronology. The fact that Homo neanderthalensis is only to be found in a contiguous range of presence in Eurasia and the general acceptance of the Out of Africa hypothesis suggests that the species has evolved locally. Again, consensus prevails on this matter, widely debated are origin and evolution patterns. Neanderthal fossil record ranges from Western Europe to the Altai Mountains in Central Asia and the Ural Mountains in the North to the Levant in the South. Unlike its predecessors they were biologically and culturally adapted to survival in cold environments and successfully extended their range to the glacial environments of central Europe and the Russian plains. The great number and in some cases exceptional state of preservation of Neanderthal fossils and cultural assemblages enables researchers to provide a detailed and accurate data on behavior and culture. Neanderthals are associated with the Mousterian culture (Mode 3), stone tools that first appeared approximately 160.000 years ago. Homo sapiens arrived in Europe around 45,000 and 43,000 years ago via the Levant and entered the continent through the Danubian corridor as the fossils at Peștera cu Oase suggest. These fossils' genetic structure, that indicates a recent Neanderthal ancestry and the discovery of a fragment of a skull in Israel in 2008 support the notion that humans interbred with Neanderthals in the Levant. After the slow processes of the previous hundreds of thousands of years a turbulent period of Neanderthal – Homo sapiens coexistence demonstrated, that cultural evolution had replaced biological evolution as the primary force of adaptation and change in human societies. Generally small and widely dispersed fossil sites suggest, that Neanderthals lived in less numerous and socially more isolated groups than Homo sapiens. Tools and Levallois points are remarkably sophisticated from the outset, yet they have a slow rate of variability and general technological inertia is noticeable during the entire fossil period. Artifacts are of utilitarian nature, symbolic behavioral traits are undocumented before the arrival of modern humans. 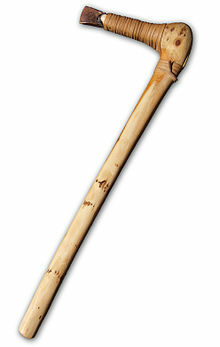 The Aurignacian culture, introduced by modern humans is characterized by cut bone or antler points, fine flint blades and bladelets struck from prepared cores rather than using crude flakes. The oldest examples and subsequent widespread tradition of prehistoric art originate from the Aurignacian. After more than 100,000 years of uniformity, around 45,000 years BP the Neanderthal fossil record changed abruptly. The Mousterian had quickly become more versatile and was named the Chatelperronian culture and thereby signifies the diffusion of Aurignacian elements into Neanderthal culture. Although debated, this fact proved that Neanderthals had to some extent adopted the culture of modern Homo sapiens. However, the Neanderthal fossil record completely vanished after 40,000 years BP. Whether Neanderthal was also successful in diffusing his genetic heritage into Europe's future population or whether he simply went extinct and if so, what caused it cannot conclusively be answered. Around 32,000 years ago, the Gravettian culture appeared in the Crimean Mountains (southern Ukraine). By 24,000 BP the Solutrean and Gravettian cultures were present in the southwestern region of Europe. The Gravettian technology/culture has been theorized to have come with migrations of people from the Middle East, Anatolia, and the Balkans. They might be linked with the transitional cultures mentioned before, because their techniques have some similarities and are both very different from Aurignacian ones but this issue is very obscure. The Gravettian also appeared in the Caucasus and Zagros mountains. It soon disappeared from southwestern Europe, with the notable exception of the Mediterranean coasts of Iberia. 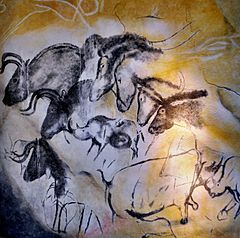 The Solutrean culture, extended from northern Spain to south-east France, includes not only a beautiful stone technology but also the first significant development of cave painting, the use of the needle and possibly that of the bow and arrow. The more widespread Gravettian culture is no less advanced, at least in artistic terms: sculpture (mainly venuses) is the most outstanding form of creative expression of these peoples. Around 19,000 BP, Europe witnesses the appearance of a new culture, known as Magdalenian, possibly rooted in the old Aurignacian one. This culture soon supersedes the Solutrean area and also the Gravettian of Central Europe. However, in Mediterranean Iberia, Italy, the Balkans and Turkey, epi-Gravettian cultures continue evolving locally. 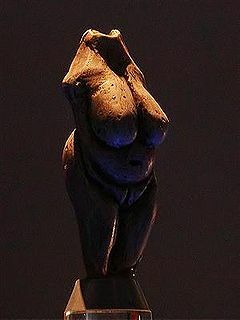 With the Magdalenian culture, Paleolithic development in Europe reaches its peak and this is reflected in art, owing to previous traditions of paintings and sculpture. Map showing hypothetical extent of Doggerland, from the Weichselian glaciation until the current situation. Around 12,500 BP, the Würm Glacial age ends. Slowly, through the following millennia, temperatures and sea levels rise, changing the environment of prehistoric people. During this time, Ireland and Great Britain become islands, and Scandinavia is separated from the main part of the European Peninsula. (They had all formerly been connected by a now-submerged region of the continental shelf known as Doggerland.) Nevertheless, Magdalenian culture persists until circa 10,000 BP, when it quickly evolves into two microlithist cultures: Azilian, in Spain and southern France, and Sauveterrian, in northern France and Central Europe. Though there are some differences, both cultures share several traits: the creation of very small stone tools called microliths and the scarcity of figurative art, which seems to have vanished almost completely, being replaced by abstract decoration of tools. In the late phase of this epi-Paleolithic period, the Sauveterrean culture evolves into the so-called Tardenoisian and influences strongly its southern neighbour, clearly replacing it in Mediterranean Spain and Portugal. The recession of the glaciers allows human colonization in Northern Europe for the first time. The Maglemosian culture, derived from the Sauveterre-Tardenois culture but with a strong personality, colonizes Denmark and the nearby regions, including parts of Britain. This was a transition period in the development of human technology between the Paleolithic and the Neolithic. The Balkan Mesolithic begins around 15,000 years ago. In Western Europe, the Early Mesolithic, or Azilian, begins about 14,000 years ago, in the Franco-Cantabrian region of northern Spain and southern France. In other parts of Europe, the Mesolithic begins by 11,500 years ago (the beginning Holocene), and it ends with the introduction of farming, depending on the region between ca. 8,500 and 5,500 years ago. In areas with limited glacial impact the term "Epipaleolithic" is sometimes preferred for the period. Regions that experienced greater environmental effects as the last glacial period ended have a much more apparent Mesolithic era, lasting millennia. In northern Europe societies were able to live well on rich food supplies from the marshlands created by the warmer climate. Such conditions produced distinctive human behaviours that are preserved in the material record, such as the Maglemosian and Azilian cultures. Such conditions delayed the coming of the Neolithic to as late as 5,500 years ago in northern Europe. As what Vere Gordon Childe termed the "Neolithic Package" (including agriculture, herding, polished stone axes, timber long houses and pottery) spread into Europe, the Mesolithic way of life was marginalised and eventually disappeared. Controversy over the means of that dispersal is discussed below in the Neolithic section. Note that a "Ceramic Mesolithic" can be distinguished between 7,200 to 5,850 years ago that ranged from southern to northern Europe. The European Neolithic is assumed to have arrived from the Near East, via Asia Minor, the Mediterranean waterway and also through the Caucasus. There has been a long discussion between migrationists (who claim that the Near Eastern farmers almost totally displaced the European native hunter-gatherers) and diffusionists (who claim that the process was slow enough to have occurred mostly through cultural transmission). A relationship has been suggested between the spread of agriculture and the diffusion of Indo-European languages, with several models of migrations trying to establish a relationship, like the Anatolian hypothesis, which sets the origin of Indo-European agricultural terminology in Anatolia. Apparently related with the Anatolian culture of Hacilar, the Greek region of Thessalia is the first place in Europe known to have acquired agriculture, cattle-herding and pottery. These early stages are known as pre-Sesklo culture. The Thessalian Neolithic culture soon evolves in the more coherent culture of Sesklo (c. 8000 BP), which is the origin of the main branches of Neolithic expansion in Europe. Practically all the Balkan Peninsula is colonized in the 6th millennium from there. That expansion, reaching the easternmost Tardenoisian outposts of the upper Tisza gives birth to the proto-Linear Pottery culture, a significant modification of the Balkan Neolithic that will be in the origin of one of the most important branches of European Neolithic: the Danubian group of cultures. In parallel, the coasts of the Adriatic and southern Italy witness the expansion of another Neolithic current of less clear origins. Settling initially in Dalmatia, the bearers of the Cardium Pottery culture may have come from Thessalia (some of the pre-Sesklo settlements show related traits) or even from Lebanon (Byblos). They are sailors, fishermen and sheep and goat herders, and the archaeological findings show that they mixed with natives in most places. Other early Neolithic cultures can be found in Ukraine and Southern Russia, where the epi-Gravettian locals assimilated cultural influxes from beyond the Caucasus (culture of Dniepr-Don and related) and in Andalusia (Spain), where the rare Neolithic of La Almagra Pottery appears without known origins very early (c. 7800 BP). This phase, starting 7000 years ago is marked by the consolidation of the Neolithic expansion towards western and northern Europe, but also by the rise of a new culture that, probably through violence, occupies most of the Balkans, substituting or rather subjugating the first Neolithic settlers. This is the culture of Dimini (Thessalia) and the related ones of Vinca-Turdas (Serbia and Romania) and Karanovo III-Veselinovo (Bulgaria and nearby areas), this last one more hybrid than the other two. Meanwhile, the tiny proto-Linear Pottery culture has given birth to two very dynamic branches: the Western and Eastern Linear Pottery Cultures. The latter is basically an extension of the Balkan Neolithic, but the more original western branch expands quickly, assimilating what today is Germany, the Czech Republic, Poland and even large parts of western Ukraine, historical Moldavia, the lowlands of Romania, and regions of France, Belgium and the Netherlands. This was all achieved in less than one thousand years. With expansion comes diversification and a number of local Danubian cultures start forming at the end of the 5th millennium. In the Mediterranean, the Cardium Pottery fishermen show no less dynamism and colonize/assimilate all of Italy and the Mediterranean regions of France and Spain. Even in the Atlantic, some groups among the native hunter-gatherers start slowly incorporating the new technologies. Among those, the most noticeable regions seem to be the southwest of Iberia, influenced by the Mediterranean but specially by the Andalusian Neolithic, which soon develops the first Megalithic burials (dolmens) and the area around Denmark (culture of Ertebölle), influenced by the Danubian complex. Danubian cultures: from northern France to Western Ukraine. Now split into several local cultures, the most relevant ones being: the Romanian branch (culture of Boian) that expands into Bulgaria, the culture of Rössen that is preeminent in the west, and the culture of Lengyel of Austria and western Hungary, which will have a major role in the upcoming periods. Mediterranean cultures: from the Adriatic to eastern Spain, including Italy and large portions of France and Switzerland. These are also diversified into several groups. The area of Dimini-Vinca: Thessalia, Macedonia and Serbia, but extending its influence also to parts of the mid-Danubian basin (Tisza, Slavonia) and southern Italy. Eastern Europe: basically central and eastern Ukraine and parts of southern Russia and Belarus (culture of Dniepr-Don). Apparently these people were the ones who first domesticated horses (though some Paleolithic evidence could disprove it). Atlantic Europe: a mosaic of local cultures, some of them still pre-Neolithic, from Portugal to southern Sweden. Since around 5800 BP the western regions of France incorporate also the Megalithic style of burial. There were also a few independent areas, including Andalusia, southern Greece and the western coasts of the Black Sea (culture of Hamangia). Diffusion of copper metallurgy in Europe. 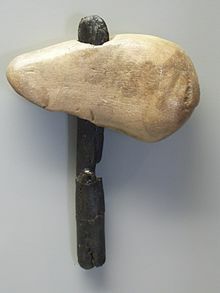 Reconstruction of Ötzi's copper axe. Also known as Copper Age, European Chalcolithic is a time of changes and confusion. The most relevant fact is the infiltration and invasion of large parts of the territory by people originating from Central Asia, considered by mainstream scholars to be the original Indo-Europeans, although there are again several theories in dispute. Other phenomena are the expansion of Megalithism and the appearance of the first significant economic stratification and, related to this, the first known monarchies in the Balkan region. The economy of the Chalcolithic, even in the regions where copper is not used yet, is no longer that of peasant communities and tribes: now some materials are produced in specific locations and distributed to wide regions. Mining of metal and stone is particularly developed in some areas, along with the processing of those materials into valuable goods. From c. 5500 to 5000 BP copper starts to be used in the Balkans, and Eastern and Central Europe. However, the key factor could be the use of horses, which would increase mobility. From c. 5500 onwards, Eastern Europe is apparently infiltrated by people originating from beyond the Volga (Yamna culture), creating a plural complex known as Sredny Stog culture, that substitutes the previous Dnieper-Donets culture, pushing the natives to migrate in a NW direction to the Baltic and Denmark, where they mix with natives (TRBK A and C). This may be correlated with the linguistic fact of the spread of Indo-European languages; see Kurgan hypothesis. Near the end of the period, another branch will leave many traces in the lower Danube area (culture of Cernavodă I), in what seems to be another invasion. Meanwhile, the Danubian Lengyel culture absorbs its northern neighbours of the Czech Republic and Poland for some centuries, only to recede in the second half of the period. In Bulgaria and Wallachia (Southern Romania), the culture of Boian-Marica evolves into a monarchy with a clearly royal cemetery near the coast of the Black Sea. 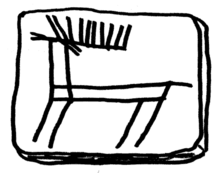 This model seems to have been copied later in the Tiszan region with the culture of Bodrogkeresztur. Labour specialization, economic stratification and possibly the risk of invasion may have been the reasons behind this development. The influx of early Troy (Troy I) is clear in both the expansion of metallurgy and social organization. In the western Danubian region (the Rhine and Seine basins) the culture of Michelsberg displaces its predecessor, Rössen. Meanwhile, in the Mediterranean basin, several cultures (most notably Chassey in SE France and La Lagozza in northern Italy) converge into a functional union, of which the most significant characteristic is the distribution network of honey-coloured silex. Despite this unity, the signs of conflicts are clear, as many skeletons show violent injuries. This is the time and area where Ötzi, the famous man found in the Alps, lived. Another significant development of this period is that the Megalithic phenomenon starts spreading to most places of the Atlantic region, bringing agriculture with it to some underdeveloped regions there. This period extends along the first half of the 3rd millennium BC. Most significant is the reorganization of the Danubians in the powerful Baden culture, that extends more or less to what would be the Austro-Hungarian empire in recent times. The rest of the Balkans is profoundly restructured after the invasions of the previous period but, with the exception of the culture of Coțofeni in a mountainous region, none of them show any eastern (or presumably Indo-European) traits. The new Ezero culture, in Bulgaria, shows the first traits of pseudo-bronze (an alloy of copper with arsenic). So does the first significant Aegean group: the Cycladic culture after 2800 BC. Large towns with stone walls appear in two different areas of the Iberian Peninsula: one in the Portuguese region of Estremadura (culture of Vila Nova de Sao Pedro), strongly embedded in the Atlantic Megalithic culture; the other near Almería (SE Spain), centred around the large town of Los Millares, of Mediterranean character, probably affected by eastern cultural influxes (tholoi). Despite the many differences the two civilizations seem to be in friendly contact and to have productive exchanges. In the area of Dordogne (Aquitaine, France), a new unexpected culture of bowmen appears: it is the culture of Artenac, that soon takes control of western and even northern France and Belgium. In Poland and nearby regions, the putative Indo-Europeans reorganize and consolidate again with the culture of the Globular Amphoras. Nevertheless, the influence of many centuries in direct contact with the still-powerful Danubian peoples has greatly modified their culture. This period extends from c. 2500 BC to c. 1800 or 1700 BC (depending on the region). The dates are general for the whole of Europe, and the Aegean area is already fully in the Bronze Age. c. 2500 BC the new Catacomb culture (proto-Cimmerians? ), whose origins are obscure but who are also Indo-Europeans, displaces the Yamna peoples in the regions north and east of the Black Sea, confining them to their original area east of the Volga. The Catacomb culture is the first to introduce corded pottery decorations into the steppes and shows a profuse use of the polished battle axe, providing a link to the West. Parallels with the Afanasevo culture, including provoked cranial deformations, provide a link to the East. Some of these infiltrate Poland and may have played a significant but unclear role in the transformation of the culture of the Globular Amphorae into the new Corded Ware culture. Whatever happened, the fact is that c. 2400 BC this people of the Corded Ware replace their predecessors and expand to Danubian and Nordic areas of western Germany. One related branch invades Denmark and southern Sweden (Scandinavian culture of Individual Sepultures), while the mid-Danubian basin, though showing more continuity, shows also clear traits of new Indo-European elites (Vučedol culture). Simultaneously, in the west, the Artenac peoples reach Belgium. With the partial exception of Vučedol, the Danubian cultures, so buoyant just a few centuries ago, are wiped off the map of Europe. The rest of the period is the story of a mysterious phenomenon: the Beaker people. This group seems to be of mercantile character and to like being buried according to a very specific, almost invariable, ritual. Nevertheless, out of their original area of western Central Europe, they appear only inside local cultures, so they never invaded and assimilated but rather went to live among those peoples, keeping their way of life. This is why they are believed to be merchants. The rest of the continent remains mostly unchanged and in apparent peace. From c. 2300 BC the first Beaker Pottery appears in Bohemia and expands in many directions but particularly westward, along the Rhone and the sea shores, reaching the culture of Vila Nova (Portugal) and Catalonia (Spain) as their limits. Simultaneously but unrelatedly, c. 2200 BC in the Aegean region, the Cycladic culture decays, being substituted by the new palatine phase of the Minoan culture of Crete. The second phase of Beaker Pottery, from c. 2100 BC onwards, is marked by the displacement of the centre of this phenomenon to Portugal, inside the culture of Vila Nova. This new centre's influence reaches to all southern and western France but is absent in southern and western Iberia, with the notable exception of Los Millares. After c. 1900 BC, the centre of the Beaker Pottery returns to Bohemia, while in Iberia we see a decentralization of the phenomenon, with centres in Portugal but also in Los Millares and Ciempozuelos. Though the use of bronze started much earlier in the Aegean area, the date of 2000 BC can be considered typical for the start of this stage in Europe in general. c. 1800 BC, the culture of Los Millares in SW Spain is substituted by that of El Argar, fully of the Bronze Age, which may well have been a centralized state. c. 1700 BC, the Central European cultures of Unetice, Adlerberg, Straubing and pre-Lausitz start working the Bronze, a technique that reached them through the Balkans and Danube. c. 1600 BC is considered a good approximate date to place the start of Mycenaean Greece, after centuries of infiltration of Indo-European Greeks from an unknown origin. c. 1500 BC, most of these Central European cultures are unified in the powerful Tumulus culture. Simultaneously but unrelatedly, the culture of El Argar starts its phase B, characterized by a detectable Aegean influence (pithoi burials). About this time, it is believed that Minoan Crete fell under the rule of the Mycenaean Greeks. c. 1300 BC, the Indo-European cultures of Central Europe (among them Celts, Italics and certainly Illyrians) change the cultural phase conforming to the expansionist Urnfield culture, starting a quick expansion that brings them to occupy most of the Balkans, Asia Minor, where they destroy the Hittite Empire (conquering the secret of iron smelting), NE Italy, parts of France, Belgium, the Netherlands, NE Spain and SW England. Derivations of this sudden expansion are the Sea Peoples that attacked Egypt unsuccessfully for some time, including the Philistines (Pelasgians?) and the Dorians, most likely hellenized members of this group that ended invading Greek itself and destroying the might of Mycene and, later, Troy. Simultaneously, around this date, the culture of Vila Nova de Sao Pedro (that lasted 13 centuries in its urban form) vanishes into a less spectacular one but finally with bronze. The centre of gravity of the Atlantic cultures (Atlantic Bronze complex) is now displaced towards Great Britain. Also about this date, the culture of Villanova, possible precursor of the Etruscan civilization, appears in central Italy (possibly with an Aegean origin). Though the use of iron was known to the Aegean peoples about 1100 BC, it didn't reach Central Europe before 800 BC, giving way to the Hallstatt culture, an Iron Age evolution of the Urnfield culture. Around that time the Phoenicians, benefitting from the disappearance of the Greek maritime power (Greek Dark Ages) founded their first colony at the entrance of the Atlantic Ocean: in Gadir (modern Cádiz), most likely as a merchant outpost to convey the many mineral resources of the Iberian Peninsula and the British Isles. Nevertheless, from the 7th century BC onwards, the Greek nation recovers its power and starts its own colonial expansion, founding Massalia (modern Marseilles) and its Iberian outpost of Emporion (modern Empúries). This last thing wasn't done before the Iberians could reconquer Catalonia and the Ebro valley from the Celts, separating physically the Iberian Celts from their continental neighbours. 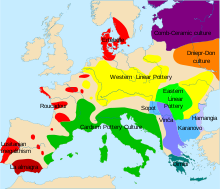 The second phase of the European Iron Age is defined particularly by the Celtic La Tène culture, that starts near 400 BC, followed by a large expansion of this people into the Balkans, the British Isles (where they assimilated druidism) and other regions of France and Italy. The decline of Celtic power under the expansive pressure of Germanic tribes (originally from Scandinavia and Lower Germany) and the forming Roman Empire, in the last century BC, is also that of the end of prehistory properly speaking; though many regions of Europe remained yet illiterate and therefore out of written history for many centuries yet, we must place the boundary somewhere and this date, near the start of our calendar, seems quite convenient. The remaining is regional prehistory (or in most cases protohistory) but no longer European prehistory as a whole. The genetic history of Europe has been inferred by observing the patterns of genetic diversity across the continent and in the surrounding areas. Use has been made of both classical genetics and molecular genetics. Analysis of the DNA of the modern population of Europe has mainly been used but use has also been made of ancient DNA. This analysis has shown that modern man entered Europe from the Near East before the Last Glacial Maximum but retreated to refuges in southern Europe in this cold period. Subsequently, people spread out over the whole continent, with subsequent limited immigration from the Near East and Asia. The written linguistic record in Europe first begins with the Mycenaean record of early Greek in the Late Bronze Age. Unattested languages spoken in Europe in the Bronze and Iron Ages are the object of reconstruction in the field of historical linguistics, in the case of Europe predominantly Indo-European linguistics. Indo-European is assumed to have spread from the Pontic steppe at the very beginning of the Bronze Age, reaching Western Europe contemporary with the Beaker culture, after about 5,000 years ago. Various pre-Indo-European substrates have been postulated, but remain speculative; the "Pelasgian" and "Tyrsenian" substrates of the Mediterranean world, an "Old European" (which may itself have been an early form of Indo-European), a "Vasconic" substrate ancestral to the modern Basque language, or a more widespread presence of early Finno-Ugric languages in northern Europe. An early presence of Indo-European throughout Europe has also been suggested ("Paleolithic Continuity Theory"). Donald Ringe emphasizes the "great linguistic diversity" which would generally have been predominant in any area inhabited by small-scale, tribal pre-state societies. ^ "Oldest Human Fossil in Western Europe Found in Spain". Popular-archaeology. Retrieved December 28, 2016. ^ Carbonell, Eudald; et al. (27 March 2008). "The first hominin of Europe" (PDF). Nature. 452 (7186): 465–469. Bibcode:2008Natur.452..465C. doi:10.1038/nature06815. PMID 18368116. ^ "Prehistory – definition of prehistory in English". oxford dictionaries. Retrieved December 28, 2016. ^ "Ancient Scripts: Linear A". Ancientscripts.com. Retrieved December 29, 2016. ^ "Herodotus – Ancient History". History com. Retrieved December 29, 2016. ^ "Historical Narratives and Christian Identity on a European Periphery, Early History Writing in Northern, East-Central, and Eastern Europe (c.1070–1200)". Brepols Publishers. Retrieved January 12, 2019. ^ "Archaeological Site of Atapuerca". UNESCO World Heritage Centre. Retrieved December 28, 2016. ^ "Fossils Reveal Clues on Human Ancestor". The New York Times. 20 September 2007. ^ Bischoff, James L.; Shamp, Donald D.; Aramburu, Arantza; Arsuaga, Juan Luis; Carbonell, Eudald; Bermudez de Castro, J.M. (2003). "The Sima de los Huesos Hominids Date to Beyond U/Th Equilibrium (>350kyr) and Perhaps to 400–500kyr: New Radiometric Dates". Journal of Archaeological Science. 30 (3): 275–80. doi:10.1006/jasc.2002.0834. ^ "Neanderthals' Last Stand Is Traced". The New York Times. September 13, 2006. Retrieved September 26, 2016. ^ "Fossil Teeth Put Humans in Europe Earlier Than Thought". The New York Times. 2 November 2011. ^ "DNA Deciphers Roots of Modern Europeans". The New York Times. June 10, 2015. Retrieved December 28, 2016. 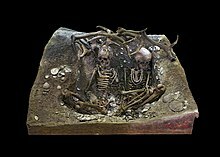 ^ "Lepenski Vir – Schela Cladovei culture's chronology and its interpretation". Retrieved December 29, 2016. ^ "Archaeological Exhibitions". Duncancaldwell. Retrieved December 29, 2016. ^ "Serbian site may have hosted first copper makers". UCL Institute of Archaeology. Retrieved December 29, 2016. ^ "Early metallurgy: copper smelting, Belovode, Serbia: Vinča culture". quantumfuturegroup.org. Retrieved December 29, 2016. ^ "The oldest Copper Metallurgy in the Balkans" (PDF). Penn Museum. Retrieved December 29, 2016. ^ "HISTORY OF METALLURGY". HistoryWorld.net. Retrieved December 29, 2016. ^ "The Development of Social Stratification in Bronze Age Europe (and Comments and Reply)". Academia.edu. Retrieved December 29, 2016. ^ "The Hittites: Civilization, History & Definition" (Video & Lesson Transcript). Study.com. Retrieved December 29, 2016. ^ Slomp, Hans (2011). Europe, A Political Profile: An American companion to European politics. ABC-CLIO. p. 50. ISBN 978-0313391811. ^ "Lithic Assemblage Dated to 1.57 Million Years Found at Lézignan-la-Cébe, Southern France". Anthropology.net. Retrieved December 30, 2016. ^ "Creationist Arguments: Orce Man". Talkorigins. Retrieved December 31, 2016. ^ Bermúdez; de Castro, JM; Martinón-Torres, M; Gómez-Robles, A; Prado-Simón, L; Martín-Francés, L; Lapresa, M; Olejniczak, A; Carbonell, E (2011). "Early Pleistocene human mandible from Sima del Elefante (TE) cave site in Sierra de Atapuerca (Spain): a comparative morphological study". Journal of Human Evolution. 61 (1): 12–25. doi:10.1016/j.jhevol.2011.03.005. PMID 21531443. ^ "Paleolithic settlement". Encyclopædia Britannica. Retrieved December 31, 2016. ^ Moncel, Marie-Hélène; Despriée, Jackie; Voinchet, Pierre; Tissoux, Hélène; Moreno, Davinia; Bahain, Jean-Jacques; Courcimault, Gilles; Falguères, Christophe (2013). "Early Evidence of Acheulean Settlement in Northwestern Europe – La Noira Site, a 700,000 Year-Old Occupation in the Center of France". PLoS ONE. 8 (11): e75529. Bibcode:2013PLoSO...875529M. doi:10.1371/journal.pone.0075529. PMC 3835824. PMID 24278105. ^ "Early Human Evolution: Homo ergaster and erectus". palomar edu. Retrieved December 31, 2016. ^ Cookson, Clive (June 27, 2014). "Palaeontology: How Neanderthals evolved". Financial Times. Retrieved October 28, 2015. ^ Callaway, Ewen (19 June 2014). "'Pit of bones' catches Neanderthal evolution in the act". Nature News. doi:10.1038/nature.2014.15430. ^ "Oldest Ancient-Human DNA Details Dawn of Neandertals". Scientific American. March 14, 2016. Retrieved September 26, 2016. ^ Edwards, Owen (March 2010). "The Skeletons of Shanidar Cave". Smithsonian. Retrieved 17 October 2014. ^ Shaw, Ian; Jameson, Robert, eds. (1999). A Dictionary of Archaeology. Blackwell. p. 408. ISBN 978-0-631-17423-3. Retrieved 1 August 2016. ^ Wilford, John Noble (2 Nov 2011). "Fossil Teeth Put Humans in Europe Earlier Than Thought". New York Times. Retrieved 2012-04-19. ^ "Chapter 5: Hunting & Gathering Societies". Florida International University. Retrieved December 31, 2016. ^ "Creativity in human evolution and prehistory" (PDF). Arizona University. Retrieved December 31, 2016. ^ Mellars, P. (2006). "Archeology and the Dispersal of Modern Humans in Europe: Deconstructing the Aurignacian". Evolutionary Anthropology. 15 (5): 167–182. doi:10.1002/evan.20103. ^ "Homo neanderthalensis Brief Summary". EOL. Retrieved September 26, 2016. ^ Peresani, M; Dallatorre, S; Astuti, P; Dal Colle, M; Ziggiotti, S; Peretto, C (2014). "Symbolic or utilitarian? Juggling interpretations of Neanderthal behavior: new inferences from the study of engraved stone surfaces". J Anthropol Sci. 92 (92): 233–55. doi:10.4436/JASS.92007. PMID 25020018. ^ "Chatelperronian Transition to Upper Paleolithic". About.com. Retrieved December 31, 2016. ^ Prat, Sandrine; Péan, Stéphane C.; Crépin, Laurent; Drucker, Dorothée G.; Puaud, Simon J.; Valladas, Hélène; Lázničková-Galetová, Martina; van der Plicht, Johannes; Yanevich, Alexander (17 June 2011). "The Oldest Anatomically Modern Humans from Far Southeast Europe: Direct Dating, Culture and Behavior". plosone. doi:10.1371/journal.pone.0020834. ^ Carpenter, Jennifer (20 June 2011). "Early human fossils unearthed in Ukraine". BBC. Retrieved 21 June 2011. ^ "The Copper Age in northern Italy". University of Arizona Libraries. Retrieved December 29, 2017. ^ "Re-Examining Late Chalcolithic Cultural Collapse in South-East Europe". Academia.edu. Retrieved January 1, 2017. ^ "For what they were... we are: Neolithic and Chalcolithic demographics of Western and Northern Europe". Forwhattheywereweare. Retrieved January 1, 2017. ^ Haarmann, Harald (1996). Early Civilization and Literacy in Europe: An Inquiry Into Cultural. ISBN 978-3110146516. Retrieved December 29, 2017. ^ "Alternative Linguiatics – Ethnicity of the Neolithic and Chalcolithic cultures of Eastern Europe". Alterling ucoz de. Retrieved January 1, 2017. ^ Haarmann, Harald (1996). Early civilization and literacy in Europe : an inquiry into cultural continuity in the Mediterranean world. Berlin: Mouton de Gruyter. ISBN 978-3110146516. ^ Wells, Peter S.; Geddes, David S. (2017). "Neolithic, Chalcolithic, and Early Bronze in West Mediterranean Europe". American Antiquity. 51 (4): 763. doi:10.2307/280864. JSTOR 280864. ^ Ringe, Don (January 6, 2009). "The Linguistic Diversity of Aboriginal Europe". Language Log. Mark Liberman. Retrieved 22 September 2011. Achilli, Alessandro; Rengo, Chaira; Magri, Chiara; Battaglia, Vincenza; Olivieri, Anna; Scozari, Rosaria; Cruciani, Fulvio; Zeviani, Massimo; Briem, Egill; Carelli, Valerio; Moral, Pedro; Dugoujon, Jean-Michel; Roostalu, Urmas; Loogväli, Eva-Liss; Kivisild, Toomas; Bandelt, Hans-Jürgen; Richards, Martin; Villems, Richard; Santachiara-Benerecetti, A. Silvana; Semino, Ornella; Torroni, Antonio (2004). "The Molecular Dissection of mtDNA Haplogroup H Confirms that the Franco-Cantabrian Glacial Refuge was a Major Source for the European Gene Pool". American Journal of Human Genetics. 75 (5): 910–918. doi:10.1086/425590. PMC 1182122. PMID 15382008. Adams, Jonathan; Otte, Marcel (1999). "Did Indo-European Languages Spread Before Farming?". Current Anthropology. 40 (1): 73–77. doi:10.1086/515804. Childe, V. Gordon. 1925. The Dawn of European Civilization. New York: Knopf. Childe V.Gordon. 1950. Prehistoric Migrations in Europe. Oslo: Aschehoug. Cavalli-Sforza L.L., Paolo Menozzi, Alberto Piazza. 1994. The History and Geography of Human Genes. Princeton: Princeton University Press. Finnilä, Saara; Lehtonen, Mervi S.; Majamaa, Kari (2001). "Phylogenetic Network for European mtDNA". American Journal of Human Genetics. 68 (6): 1475–1484. doi:10.1086/320591. PMC 1226134. PMID 11349229. Gimbutas, M (1980). "The Kurgan wave migration (c. 3400–3200 B.C.) into Europe and the following transformation of culture". Journal of Near Eastern Studies. 8: 273–315. Macaulay, Vincent; Richards, Martin; Hickey, Eileen; Vega, Emilce; Cruciani, Fulvio; Guida, Valentina; Scozzari, Rosaria; Bonné-Tamir, Batsheva; Sykes, Bryan; Torroni, Antonio (1999). "The Emerging Tree of West Eurasian mtDNAs: A Synthesis of Control-Region Sequences and RFLPs". American Journal of Human Genetics. 64 (1): 232–249. doi:10.1086/302204. PMC 1377722. PMID 9915963. Piccolo, Salvatore. 2013. Ancient Stones: The Prehistoric Dolmens of Sicily. Abingdon (GB): Brazen Head Publishing. Renfrew, Colin. 2001. "The Anatolian origins of Proto-Indo-European and the autochthony of the Hittites." In Greater Anatolia and the Indo-Hittite Language Family, R. Drews ed., pp. 36–63. Washington, DC: Institute for the Study of Man. Venemann, Theo. 2003. Europa Vasconica, Europa Semitica. Trends in Linguistic Studies and Monographs No. 138. New York and Berlin: Mouton de Gruyter. Wikivoyage has travel information for Prehistoric Europe. In Old World archaeology, Mesolithic is the period between the Upper Paleolithic and the Neolithic. The term Epipaleolithic is often used synonymously, especially for outside northern Europe, and for the corresponding period in the Levant and Caucasus. The Mesolithic has different time spans in different parts of Eurasia. It refers to the final period of hunter-gatherer cultures in Europe and Western Asia, between the end of the Last Glacial Maximum and the Neolithic Revolution. In Europe it spans roughly 15,000 to 5,000 BP; in Southwest Asia roughly 20,000 to 8,000 BP. The term is less used of areas further east, and not at all beyond Eurasia and North Africa. The Gravettian was an archaeological industry of the European Upper Paleolithic that succeeded the Aurignacian circa 33,000 years BP. 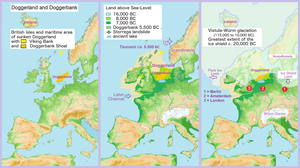 It is archaeologically the last European culture many consider unified, and had mostly disappeared by c. 22,000 BP, close to the Last Glacial Maximum, although some elements lasted until c. 17,000 BP. At this point, it was replaced abruptly by the Solutrean in France and Spain, and developed into or continued as the Epigravettian in Italy, the Balkans, Ukraine and Russia. The history of Eurasia is the collective history of a continental area with several distinct peripheral coastal regions: the Middle East, South Asia, East Asia, Southeast Asia, and Europe, linked by the interior mass of the Eurasian steppe of Central Asia and Eastern Europe. 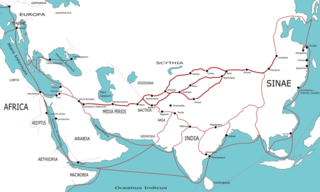 Perhaps beginning with the Steppe Route trade, the early Silk Road, the Eurasian view of history seeks establishing genetic, cultural, and linguistic links between European and Asian cultures of antiquity. In fact, much interest in this area lies with the presumed origin of the speakers of the Proto-Indo-European language and Chariot warfare in Central Eurasia. The Upper Paleolithic is the third and last subdivision of the Paleolithic or Old Stone Age. Very broadly, it dates to between 50,000 and 10,000 years ago, according to some theories coinciding with the appearance of behavioral modernity and before the advent of agriculture. Santimamiñe cave, Kortezubi, Biscay, Basque Country, Spain, is one of the most important archaeological sites of the Basque Country, including a nearly complete sequence from the Middle Paleolithic to the Iron Age. The prehistory of the Iberian Peninsula begins with the arrival of the first hominins 1.2 million years ago and ends with the Punic Wars, when the territory enters the domains of written history. In this long period, some of its most significant landmarks were to host the last stand of the Neanderthal people, to develop some of the most impressive Paleolithic art, alongside southern France, to be the seat of the earliest civilizations of Western Europe and finally to become a most desired colonial objective due to its strategic position and its many mineral riches. The Stone Age in territory of today's Poland is divided into the Paleolithic, Mesolithic and Neolithic eras. The Paleolithic extended from about 500,000 BCE to 8000 BCE. The Paleolithic is subdivided into periods, the Lower Paleolithic, 500,000 to 350,000 BCE, the Middle Paleolithic, 350,000 to 40,000 BCE, the Upper Paleolithic, 40,000 to 10,000 BCE, and the Final Paleolithic, 10,000 to 8000 BCE. The Mesolithic lasted from 8000 to 5500 BCE, and the Neolithic from 5500 to 2300 BCE. The Neolithic is subdivided into the Neolithic proper, 5500 to 2900 BCE, and the Copper Age, 2900 to 2300 BCE. Paleolithic Europe, the Lower or Old Stone Age in Europe encompasses the era from the arrival of the first archaic humans, about 1.4 million years ago until the beginning of the Mesolithic around 10,000 years ago. This period thus covers over 99% of the total human presence on the European continent. The early arrival and disappearance of Homo erectus and Homo heidelbergensis, the appearance, complete evolution and eventual demise of Homo neanderthalensis and the immigration and successful settlement of Homo sapiens all have taken place during the European Paleolithic. The greater Basque Country comprises the Autonomous Communities of the Basque Country and Navarre in Spain and the Northern Basque Country in France. The Prehistory of the region begins with the arrival of the first hominin settlers during the Paleolithic and lasts until the conquest and colonisation of Hispania by the Romans after the Second Punic War, who introduced comprehensive administration, writing and regular recordings. The prehistory of Southeastern Europe, defined roughly as the territory of the wider Balkan peninsula covers the period from the Upper Paleolithic, beginning with the presence of Homo sapiens in the area some 44,000 years ago, until the appearance of the first written records in Classical Antiquity, in Greece as early as the 8th century BC. The prehistory of Corsica is analogous to the prehistories of the other islands in the Mediterranean Sea, such as Sicily, Sardinia, Malta and Cyprus, which could only be accessed by boat and featured cultures that were to some degree insular; that is, modified from the traditional Paleolithic, Mesolithic, Neolithic and Chalcolithic of European prehistoric cultures. The islands of the Aegean Sea and Crete early developed Bronze Age civilizations and are accordingly usually treated under those categories. Stone Age Crete however shares some of the features of the prehistoric Mediterranean islands. The La Garma cave complex is a parietal art-bearing paleoanthropological cave system in Cantabria, Spain. It is located just north of the village of Omoño, part of the municipality of Ribamontán al Monte. The cave complex is noted for one of the best preserved floors from the Paleolithic containing over 4,000 fossils and over 500 graphical units. 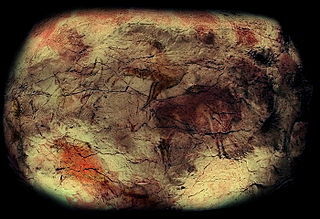 It is part of the Cave of Altamira and Paleolithic Cave Art of Northern Spain World Heritage Site. The Goyet Caves are a series of connected caves located in a limestone cliff about 15 m above the river Samson near the village of Mozet in the Gesves municipality of the Namur province, Belgium. The site is a significant locality of regional Neanderthal and European early modern human occupation, as thousands of fossils and artifacts were discovered that are all attributed to a long and contiguous stratigraphic sequence from 120,000 years ago, the Middle Palaeolithic to less than 5.000 years ago, the late Neolithic. A robust sequence of sediments was identified during extensive excavations by geologist Edouard Dupont, who undertook the first probings as early as 1867. The site was added to the Belgian National Heritage register in 1976.